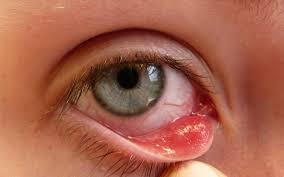 A stye is caused by a blocked oil gland (meibomian gland) in the eyelid that becomes infected. It results in a swollen, pus-filled nodule on the upper or lower part of the lid that is inflamed and infectious. The most frequent cause of styes is staphylococcus aureus. Styes can be uncomfortable, red, and painful. A stye is often confused with a chalazion – chalazia are smaller than styes and are not painful. The good news is styes are usually harmless. However, for people with meibomian gland dysfunction, recurring styes can be an issue. Most styes clear up in 7 to 10 days. To treat a stye at home it might help to clean your eyelids with a commercial eyelid scrub (We highly recommend our eye lid cleanser.) and apply a warm compress for 5 to 10 minutes twice daily. Wash your hands first and never squeeze the stye; also try not to rub your eyes. If you normally wear contact lenses, use your glasses until it’s healed. If a stye doesn’t improve within 48 hours, see your doctor—you might need antibiotic or anti-inflammatory eye drops, or you might need to have the stye drained. Recurring styes are associated with meibomian gland dysfunction / blepharitis. The inflammation resulting from these two conditions causes dry eyes and styes. TheraLife Eye Enhanced will restore your tear secretion glands’ ability to produce their own, well-balanced tears. 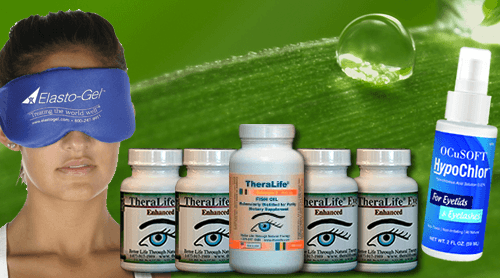 TheraLife can help relieve dry eyes with your own natural tears and create a balanced, healthy environment within the eye that will prevent the growth of styes. Use Avenova Lid Cleanser to clean eye lids, prevent future infections, and recover from blepharitis. Get this All-in-One Eye Enhanced Starter Kit and put yourself on the road to recovery! I was diagnosed with Blepharitis after a Huge stye would not go away with normal cleaning & hot compresses. I started to cleanse my eyes lids with Baby Shampoo 3x daily and hot compress daily but still get styes every other month, sometimes on both upper & lower lids at same time. Searching online I found Thera Life and started with 2 capsules morning & 2 at night plus hot compresses and cleaning with Avenova eye lid cleanser. Within a month I noticed a huge difference. I have been stye free ever since. My eye lids are no longer red and no crusty build up in the morning. As I’ve been told that Blepharitis will not go away, I will continue to take Thera Life to prevent my recurring styes and kept my eye lids healthy. Dr Yang has been in touch regularly to check my progress …truly appreciated . Chalazion/StyesRestore and revive your own tear production intra-cellularly with TheraLife Eye now! All-In-One Dry Eye Starter Kit Contains 4 bottles of TheraLife Eye (60 capsules each), 1 bottle of purified Fish Oil, 1 bottle of eye lid cleanser, 1 warm compress.